Canada has been making ski racing history for the past 70 years. Sixty years ago, Canada won its first Olympic medal and forty-eight years ago, Canada won its first World Cup. 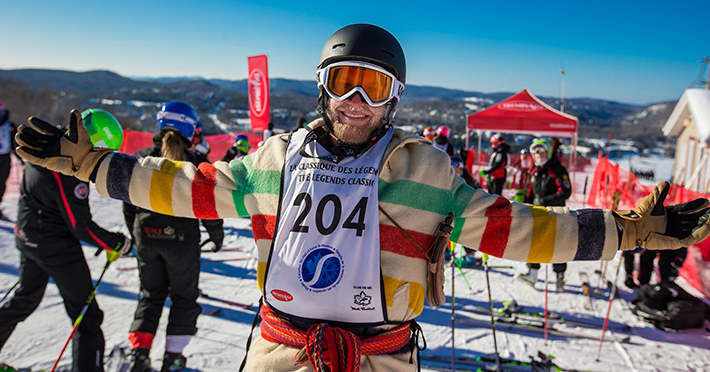 To celebrate this long history of excellence in Canadian ski racing, the National Team Alumni (1945-2015) will be participating in this year’s Legends Classic held on Saturday, February 27th, in Tremblant. The Legends Classic is a yearly event honoring skiers of all levels and all ages (7 years to 85 plus). A fun race open to everyone, this year will be quite special as skiers are invited to race with some of our country’s greatest Champions: Crazy Canuck “Jungle” Jim Hunter, Nancy Greene, Al Raine, Kathy and Laurie Kreiner, Peter Duncan, the Wurtele twins, Emily Brydon and many more! The $30.00 registration fee goes to support the Canadian Ski Hall of Fame & Museum. For details and to register for the race visit www.skimuseum.ca. To kick off this festive weekend, you’re invited to mingle with the National Team Alumni on Friday evening, February 26th, at a casual Cocktail Dinatoire reception from 6 p.m. to 9 p.m.at the Westin Resort Hotel Tremblant. Limited tickets are available at $100 p.p. After the Legends Classic, celebrations continue on Saturday evening starting at 6:30 p.m. with an elegant Cocktail Reception & Gala Banquet at Tremblant’s historic landmark, the Chalet des Voyageurs. Limited tickets are available at $200 p.p.